You may or may not know this, but I am obsessed with my dogs. Every day I do my best to make sure they’re getting everything they need and are enjoying their quality of life. They turn 15 years old this fall, and we’ve finally started noticing the effects of aging. Pandie, my girl, started having problems walking. She was wobbly, her back legs were dragging, and eventually she couldn’t walk or go to the bathroom on her own. Our vet diagnosed her with Intervertebral Disc Disease (IVDD), which is a problem with the discs in the spine and somewhat common in older dogs. Since Pandie is 14, surgery was not an option at her age, so we opted for rest and medication. At the same time as dealing with the IVDD diagnosis, we were also making frequent trips to the vet with our other 14 year old dog, Mango (Pandie’s twin brother). He was experiencing some out of character symptoms, like anxiety, insomnia, and and joint pain. After several blood tests and examinations, he was put on supplements and medication to help his symptoms and arthritis/hip/knee problems. Luckily, both dogs are now doing great and enjoying life again. Pandie has regained most of the mobility in her legs and Mango is responding well to his new treatment plan, but this all lead me to discover a few great products that I have been using and feel would benefit any dogs dealing with the effects of age or mobility issues. This was one of the first things I searched for after Pandie’s IVDD diagnosis. Because her rear legs were so weak, she couldn’t properly hold herself up long enough to go out for potty breaks. 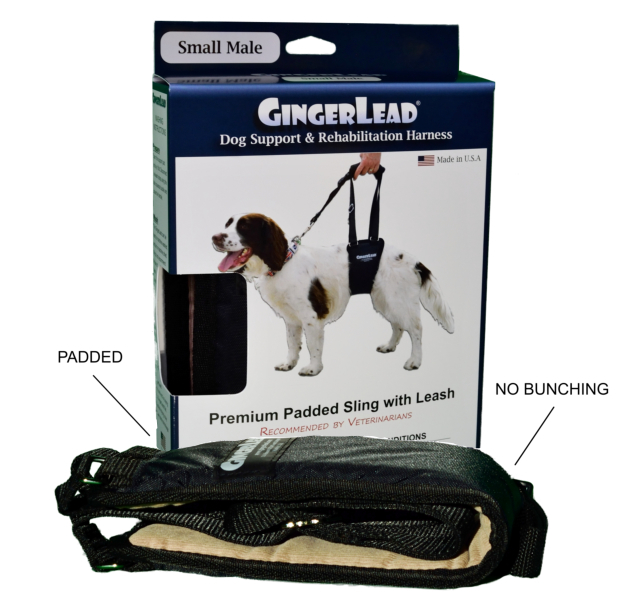 Gingerlead’s rear harness is the perfect solution, especially if you have a larger or heavier dog who can’t be easily carried around. Walking is very important for older dogs. Walks around the block can reduce the pain caused by arthritis and keep their muscles in shape to prevent atrophy. GingerLead harnesses provide support and balance so your dog can still enjoy walks, even with weak back legs. They’re also great for rehabilitation after hip and knee surgeries. The design is durable and comfortable and easy to use. Whenever Pandie is feeling a little back pain and getting weak in the legs, we pull out the GingerLead to give her a break. One of the most important things about IVDD and other back injury recovery is to keep the dog from moving around too much so the spine can heal. Most vets will prescribe complete bed or cage rest, but with a dog who isn’t crate trained and generally wants to be active, this wasn’t as simple of a task as it sounds. That’s when I found WiggleLess back braces and decided to give it a try. I could definitely see the benefits during Pandie’s recovery period. She immediately walked a little stronger and straighter. Most importantly, it kept her from doing any unwanted twisting or movements, and kept her from trying to jump on and off furniture. She also seemed generally more comfortable with it on, and she rested better. That last one could be from the “hugging” effect it gives, much like a compression shirt, but I’ll take that added bonus. Just like with the rear harness, if I notice any back pain or weakness in her legs flaring up, I put on the back brace to avoid exacerbating the injury, and it helps. These are life changing! Keeping both of my dogs from slipping and sliding around my hardwood floors was a challenge. This is a problem a lot of older dogs face, and it’s very important to keep dogs with any mobility issues as stable as possible. It’s not always feasible to put down anti-slip rugs or to put traction booties on their paws. That’s why Dr. Buzby’s Toe Grips are genius. I’ll admit, I was a little skeptical at first, and I thought they would be hard to put on, but these are AMAZING. They’re nonslip grips that fit onto your dog’s toenails, so they can stay on all the time. This provides traction to keep them from slipping and sliding on hard surfaces, which can potentially cause or exacerbate injuries, and cause anxiety about walking in certain areas. The ThunderShirt is probably something you’ve heard of before. When my dogs experience any sort of anxiety they always respond well to being held tight or swaddled in a blanket. ThunderShirt gives the same effect. It’s a specially designed compression vest that applies gentle, constant pressure which helps alleviate stress and anxiety. We use it for vet visits, traveling, and for any other anxiety triggering issues, even pain. It has helped Mango a ton with his insomnia (just look at him), allowing him to feel less anxious at night. Its design is light weight and comfortable enough to wear for hours. Now that we have it, we can’t live without it. This is a leash system that has greatly improved our walks. Walking with regular leashes can be annoying when a dog wants to go at their own pace. I was always either dragging a dog while being dragged by another dog. These retractible leashes have solved this problem. No more dragging or pulling of anyone. But that’s not the best part! The VARIO system has accessories. My favorite is the LED lighting system. It can get a little hard for some senior dogs to see as well as they used to at night. This can cause some confusion and anxiety during walks. The LED light attachment acts as a flash light and helps guide the way for both you and your dog. There are other accessories worth checking out too, and everything is attached right onto the leash for ease and comfort. 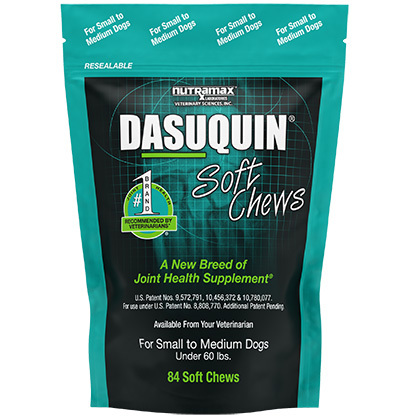 Dasuquin is a joint supplement recommended to me by my vet. I noticed a difference in my dogs within a week. Joint problems and arthritis are very common ailments as dogs age, so supplements are important. These chews are perfect because they taste good and can be used as treats! Ive also noticed they’re more gentle on my dogs’ tummies than other joint health products. I hope you might find these products as helpful as I have. As always, I have tried and tested everything that I mention here and only my honest opinions are given. If you have any questions about my experiences with what you see here, feel free to ask in the comments. Your dogs are adorable! Glad they’re feeling better! This is really great, thank you! Our dog is getting up there in years and I think she could really use a few of these items. It’s nice to see something about the needs of older dogs, since they need us more and more as they age.